Apple’s iPhone always manages to sell in high numbers when the holiday season approaches, and history has repeated itself once again this year. 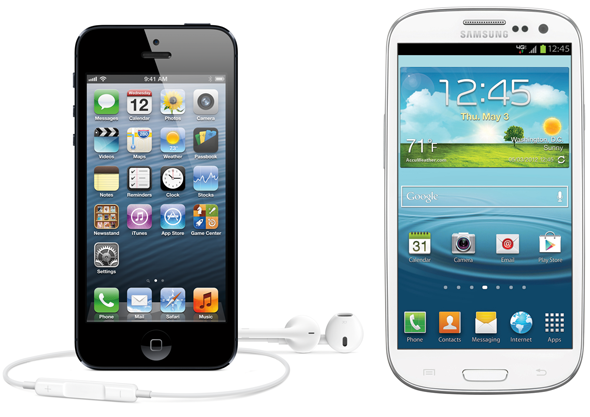 Thanks to strong sales of the brand new iPhone 5, iOS has peaked at the top of the smartphone market share in the United States, according to data collated by research outfit Kantar Worldpanel Comtech. The latest Cupertino smartphone has become the fastest-selling device of the year, and with yield now looking much stronger than it was for the first couple of months, consumers ordering the unlocked device online won’t all be waiting for four weeks for its arrival. KWC’s report totted up smartphone sales over the past twelve weeks leading up to 28th October, and found that iOS accounts for 48.1 per cent of the American smartphone market. Not only is that a whopping 25 percent higher than the same period last year, but actually pushes iOS – or specifically, the iPhone – ahead of Android. 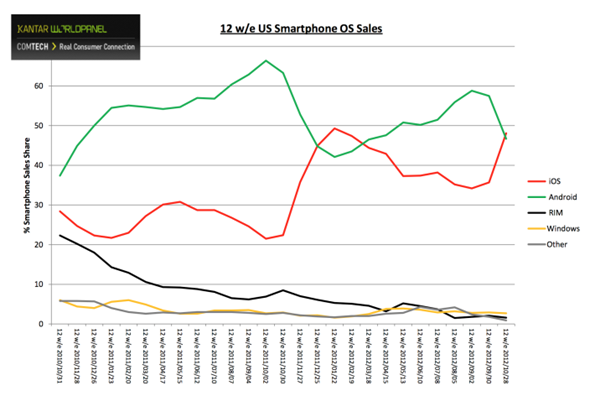 As can be seen in the chart, Android has dominated the latter stages of this year in terms of market share – thanks, in part, to the release of Samsung’s flagship Galaxy S III. However, once the initial buzz surrounding the most popular Android handset had died down and the iPhone 5 came into play, the share of the Apple smartphone has soared once more. The graph is, if you like, a microcosmic look at the smartphone market in general. Android and iOS are the two most significant platforms by a country mile, and both take it in turns to take the largest chunk of sales, depending on the month. Intriguingly, Android managed a 63.3 per cent market share on the same twelve week period last year, compared with 46.7 per cent today. However, it’s important to note that the iPhone 4S released in October of last year, so Apple’s sales didn’t have as much time to get into full flow. Had the 4S released in September 2011, the figures of last year would undoubtedly have been closer to the even keel shown here in 2012. The report also, once again, showed just how happy iPhone users are with their product. iOS customer satisfaction polls nearly always suggest those on iPhones and iPads are among the most satisfied, and with 92 percent of existing Apple owners included in this report saying they’d opt for an iPhone the next time they upgrade, Apple must be doing something right. As well as keeping hold of its own customers, it’s also doing a great job of nabbing them from the clutches of rivals. 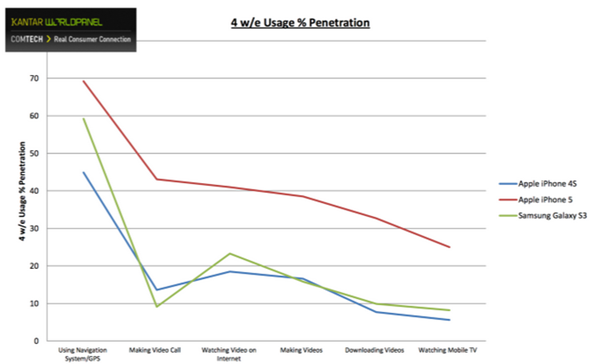 13 percent of iPhone 5 owners made the leap from Android, while 6 percent used to roll with the BlackBerry.